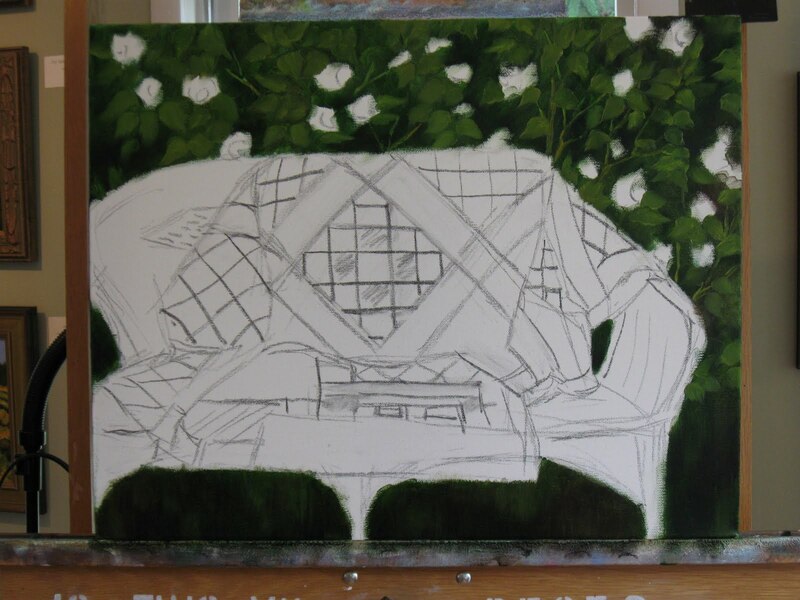 On day two, I have made lots of progress on this painting. I laid in the sky, a nice hot summery type of sky. At the same time I am working on the sky, I start laying in the water. Just colors from the sky brushed seamlessly together in a horizontal direction. I am careful to make sure the water is darker than the sky. These water colors will undergo lots of changes when I get to that part of the painting, but for now, I just need a value to keep me on track. Next I moved into the trees in the distance and placed some strokes of green where I want to remember there is dark shady areas along the waterline. By the way, it was unbearably hot in the gallery/studio today and the air conditioner could not keep up. I think that the window needs some sort of curtain or awning to keep the sun from heating up the gallery. I will look for a solution this week. I took some panoramic shots of Great Falls and made some field sketches and notes. When I printed out the panoramic shots and pieced them together I made a decision to eliminate a portion that was just uninteresting shoreline oposite where I was standing. Now the view fits the canvas perfectly. I had stretched a 20" x 40" canvas. I don't normally use the grid system to get my drawing on the canvas, but the complexity of this subject, with all its small waterfalls and bazillion rocks made it necessary for me to start with a grid. I purposely kept the grid very simple, four blocks across and two down. Starting at the center of the photograph, I repeated the grid on the photos. 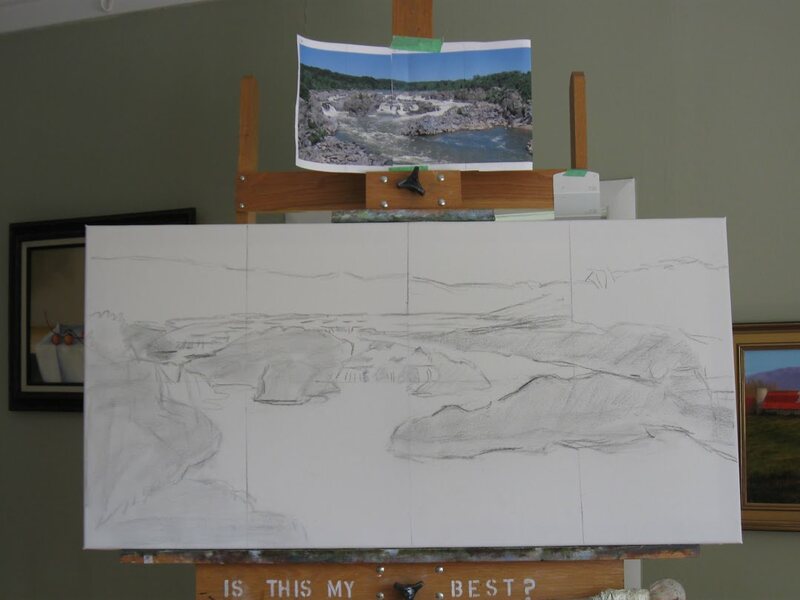 What you see here is a very simple charcoal drawing of the rock formations and waterfalls. I am now ready and psyced to begin. As I drive the 20 minute drive from Little Washington to my house in Marshall each evening, I am reminded of how blessed I am to live in such a beautiful area. Yesterday I had an extra blessing. As I passed through a wooded area of Cresthill Road I came upon a momma bear and her three cubs walking down the center of the road. They quickly became excited about my being there and started running down the road instead of off into the brush. I was awestruck at how tiny the cubs were. I had the misconception that they would be large. At one point, one of the cubs started to climb a tree, but quickly came back down when his momma went to the opposite side of the road. I reached for my camera and suddenly realized it was in the back of my car with all my other paraphenalia. Another lost opportunity. New Rule.....never leave the camera where you can't grab it at a moments notice. The bears were in the road in front of me for at least 10 minutes, enough time to have gotten six or seven great photos if I had my camera. As I worked on the quilt yesterday, I finally made the decision to take out some of the flowers and lighten the background a bit by adding more of the house siding. I am already happier with the nice arrangements of light and dark value shapes. 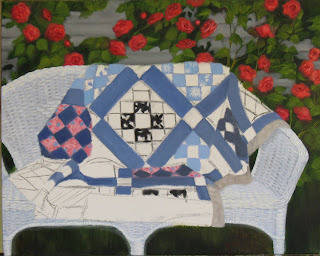 I have pretty much laid in the basic structure of the settee and have really gotten into the quilt itself. I am still not sure about eliminating some of the camelias. I want to live with the painting a bit longer before I make a major decision on the background. I am pretty happy with how this painting is going. I now have jewelry for sale at the Ice House Gallery and you can view the items at www.icehousegallery.com. Although I don't have an online store, you can see the item and price and contact me via the telephone (540-675-3039) or e-mail (sha45rps@starpower.net) to purchase an item. Coming soon will be the Little Washington notecards. Series 1 and Series 2 have four different images. Each box contains two of each image, eight notecards and envelopes per box for $15.00. I worked on the quilt commission some more this past week. I have made a critical decision about the background. 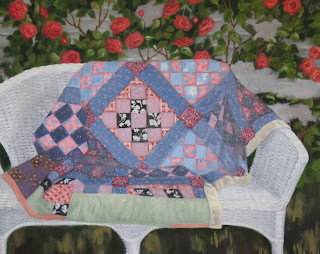 It was much too dark and seemed to isolate the wicker settee and quilt. So I have added the siding on the house behind the camelias and taken out some of the camelia greenery. I also am thinking I should remove a few of the camelias. They may be just too much of a distraction and since the painting is about the quilt, I don't want the camelias to upstage the quilt. 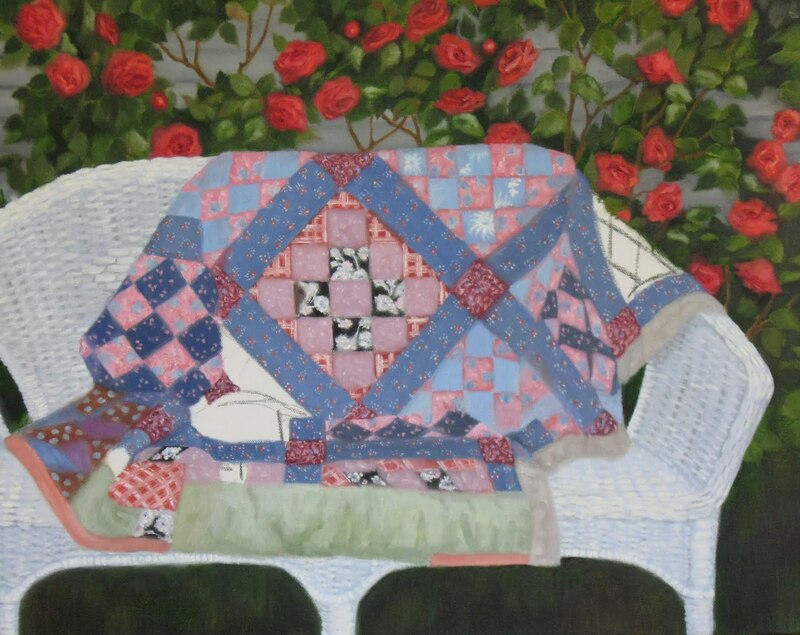 I will work some more on the quilt before I make a final decision about removing some of the flowers. 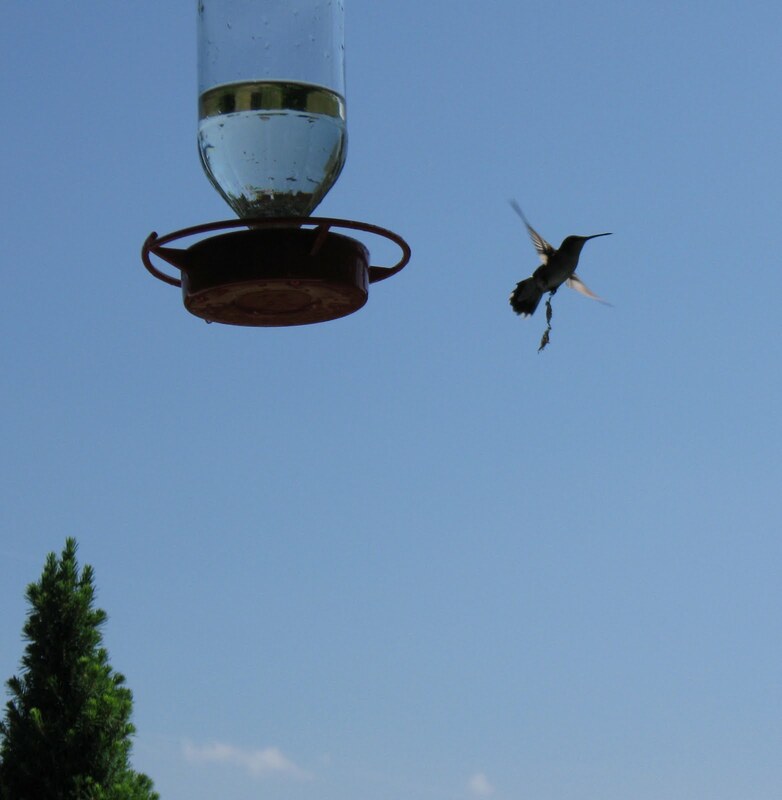 This little hummingbird has a piece of thread or string wrapped around her leg. Believe it or not, this little female has been coming to our feeder for the last four summers. I don't know how long these little birds live on average, but this one is at least four years old. I can't imagine there could be more than one bird with string around it's left foot and leg. I was amazed last summer when she showed up for the third time, now I am in awe of her strength and tenacity. I hope to get a good close up of her shortly. I am taking a day to try and finally get over the bad back. I just finished looking at www.sarahgriffinthibodeaux.com and I must say, this is one of the better sites that I frequently visit. If you are a fan of traditional portraiture, you will love this site. 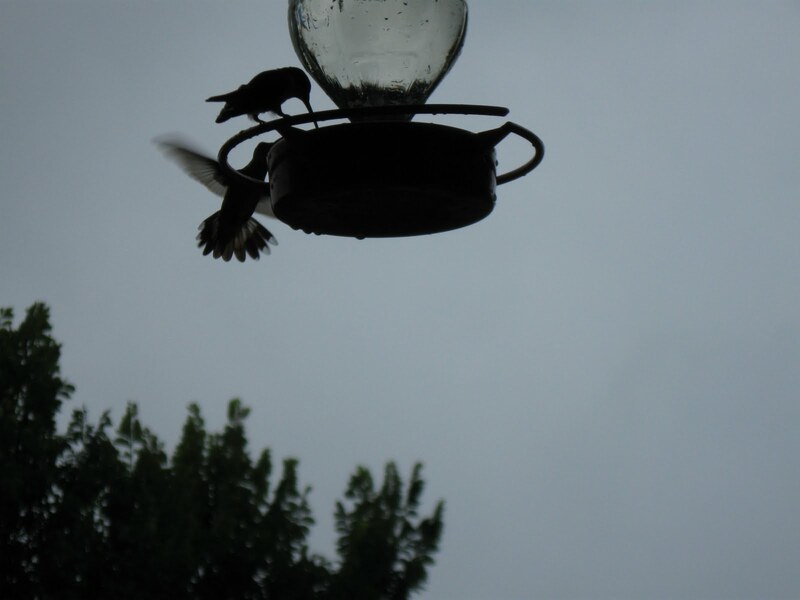 This picture of hummingbirds was taken this morning at dawn while I was having my coffee and trying to shake off the fuzzy head I get from taking the back pain medicines. My intention is to use two hummingbirds in the Saint Alice painting. I will paint them bringing down a halo for Alice. I have many more reference photos of the hummingbirds and none of them show good color because of the angle and lighting. I will try again later in the day for more colorful shots. That's if the medicines don't interfer. 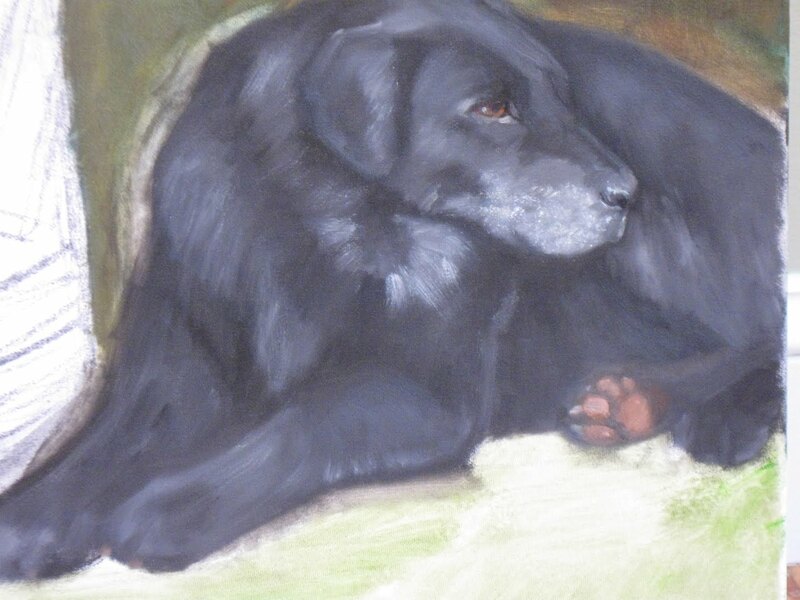 I worked on the dog in the painting, "Saint Alice of Assisi". I was thinking he looked pretty good, but now I am not as happy with it as before. I will give him a little more attention next time I work on this painting. Tell all your friends to check this out. Silver Brush has some wonderful miniature artist's brushes also. 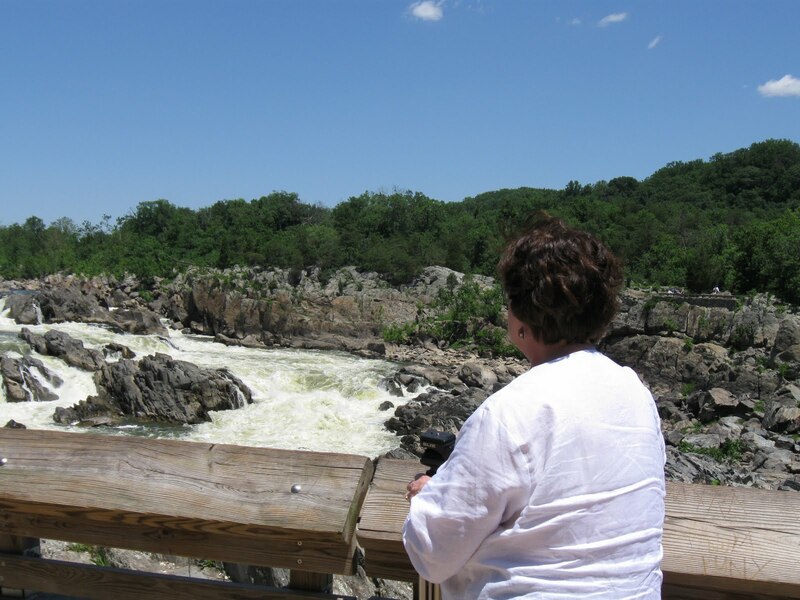 I took a trip over to Great Falls with my husband this week to gather information and reference photos for a painting I will be doing shortly. Even with the back hurting, I really enjoyed climbing on the rocks and watching the herons on the rocks below us and flying over the falls looking for fish. We spent a long time over there, it has been years since I visited the Falls. You didn't think I would let a little thing like a sore back keep me down, did you? Oh, by the way, I did finally go see a doctor and got some medicines which helped me overnight. I actually had a fairly good day today at the gallery. Labels: Falls, Great Falls, Herons, reference materials. 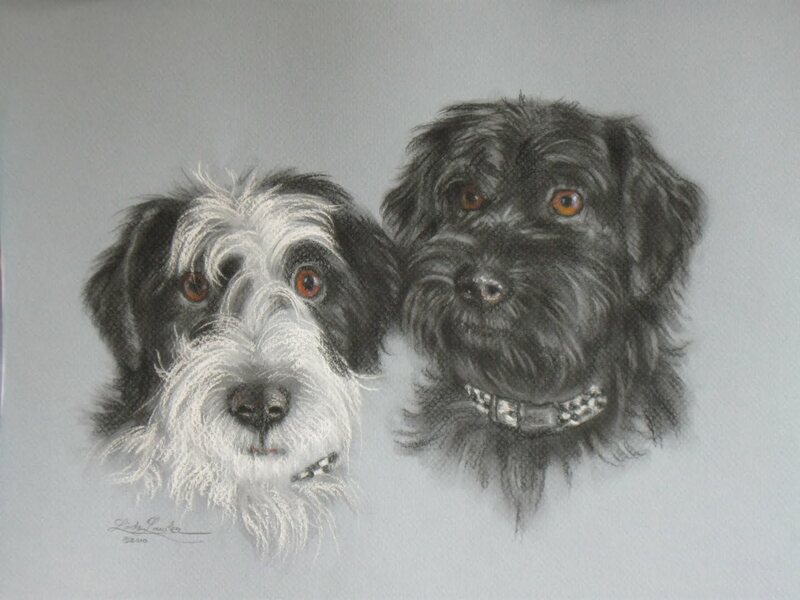 This is Mary Ann and Ginger, my most recent pet portrait commission. The person who commissioned me to do this portrait was very moved by my work. Emotion and praise are the greatest form of payment. The cash helps, but the look of love on the pet owners face is worth millions to me. This is step one of the double portrait of Mary Ann and Ginger. I am still nursing the bad back, sitting alot and laying down more than sitting. 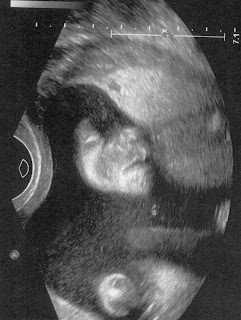 Here is the first ever picture of my grandchild. I am so amazed at technology. This is at the halfway mark of my daughter in laws pregnancy. Our grandchild is due Oct. 6. 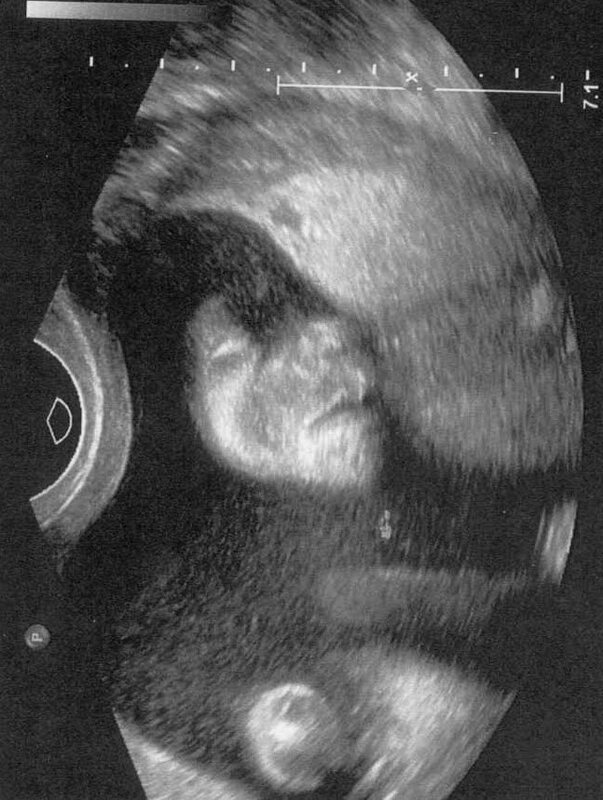 When I was expecting, the doctors were doing good to hear a heartbeat with ultrasound and stethascopes. The baby's face bears a remarkable resemblance to my son's first picture taken at 2 hours old. We feel blessed and are so excited. Well I overdid it again, cleaning up the carpets and painting the gallery. My back is spasming and all I can do is sit or lay on my stomach. 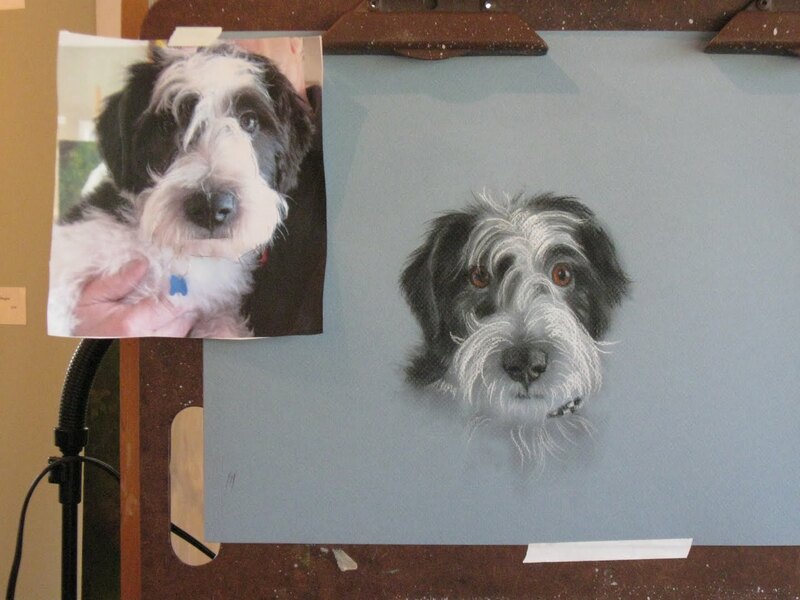 I managed to finish up the dog commission I was working on and I will get photos today and post shortly. I plan to sit quietly today and read or maybe sit at the easel and work on something not requiring me to stand. This is only one of the many Llamas my friend Alice raises. I am showing this close up because I have just spent the last three days painting the gallery and cleaning the carpets. I am so tired from the maintenance work that I may not get around to blogging again for a few days and I am too tired today to be more creative. Hope you like this cop-out entry. Here is Saint Alice at the beginning with a washed in background and then again on the second and third days of work. The background is now well developed, foliage is becoming evident, but not overly detailed. 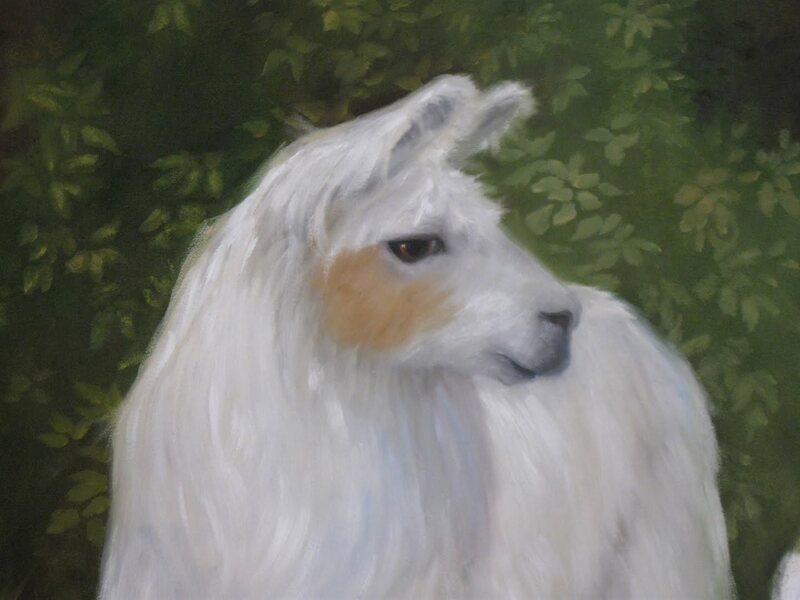 The Llama is looking real good thus far and he is looking at Alice's halo which eventually will have two hummingbirds placing it on her head. Alice has the ugliest geese I have ever seen. At first I thought of using them and then decided against it. 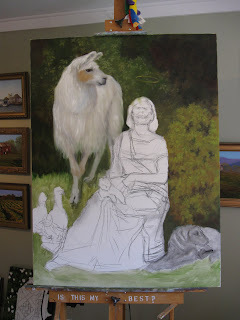 I now realize the composition will be much better with them at her side, helping to tie the Llama to the scene. 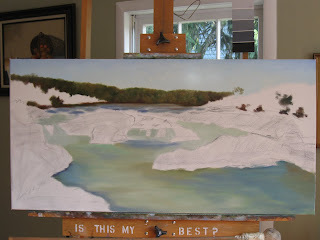 I have laid in a background color using sap green and alizarin crimson. These two colors mixed together can give you a very nice grayed green or in equal parts you get a rich brown. The white spots you see are where I plan to place camelias. 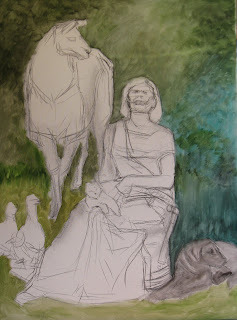 I added some cadmium yellow light to the green and some yellow ochre to another glob of the green mixture and have used these two new greens to start laying in the individual leaves in the background. I am just suggesting the leaves at this point and trying to not get too detailed in the background.....after all, the quilt is the subject and will be very detailed.